Wilds of Organica: The Arcade, June 2015! 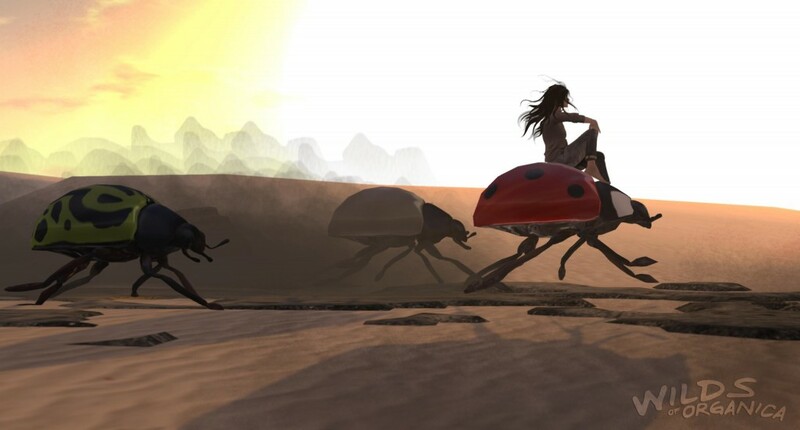 This time with a set of giant racing beetles! In collaboration with NeoBokrug Elytis of Desolate Studios, putting together these beetles has been a bit of a marathon in itself. 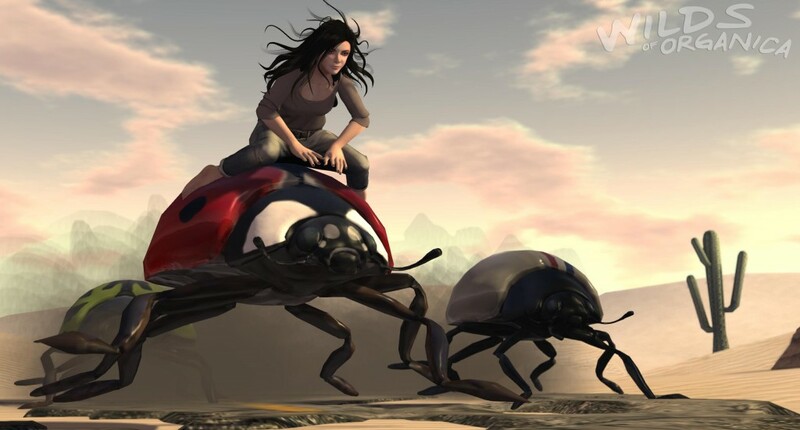 The beetles themselves are materials optimized (but still quite pleasantly viewable with older lighting setups), 10 LI each and are drivable, however these beetles not only operate as standalone vehicles but each rez with one of six different traits which affect driving in a unique way. Play the gacha machine or trade with friends to get a vehicle with the stats you want – there are six attainable combinations to try! Demo beetles will be on-hand at the Wilds of Organica main store, so if you’d like to try the beetles before locking in your (T) version for (C), this is an excellent opportunity to do so. Use either WASD or arrow keys to steer, and E or PgUp to jump. Please try to keep the beetles in the region! They will return home when you’re done. 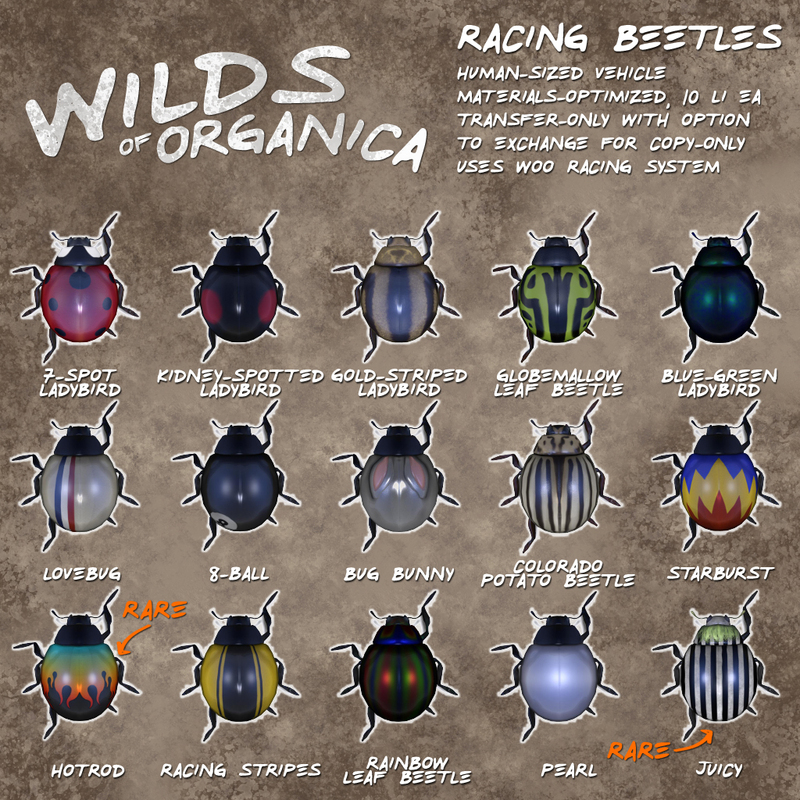 Furthermore, the beetles work with the Wilds of Organica Racing System, which brings additional racing item elements in to play such as temporary speed, handling and jumping boosts as well as temporary slows, stops or control inversion. 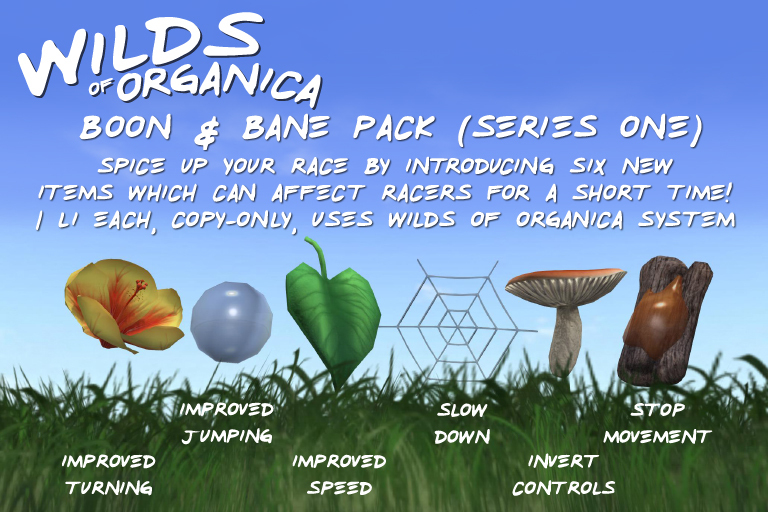 The Boon & Bane Pack is completely optional, but a fun addition to your racetrack. Each item is 1 LI and copy-only. 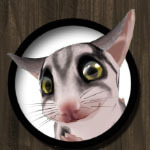 The pack is available separately at the main store. For more details, check out our Racing System Info Page. Please note: Due to the nature of transfer-only items as well as the volatile nature of vehicles & region crossings, we highly recommend locking in your vehicle for a copy-only version once you are happy with what you’ve got. Your transfer-only vehicle may be exchanged for a copy-only vehicle at the Wilds of Organica main store. There is a special, separate exchanger for vehicles. Please check the note-card included with your purchase for the location, up to date as of May 27, 2015. I have always *adored* your products, and these racing beetles look like so much fun! I can’t wait for the Arcade to open so I can get a bunch!